18. Administrative arrangements in all countries of the region show similarities, but with country specifics that often have their origin in historical developments. All countries in the region are centralized countries (with the exceptions of Austria, which is a federal country, and Bosnia and Herzegovina, which has a specific two-entity structure), and key decision-making powers are often centralized at the highest level. Most of the countries in the region have three levels of governance—national, regional (county), and municipal. However, three countries (FYR Macedonia, Montenegro, and Slovenia) have only two (national and municipal) levels, and three countries (Austria, Slovakia and Ukraine) have an additional fourth level of government between the regional and municipal levels. 19. In most cases, the national government retains overall policy-making authority over public services, but service delivery responsibility is delegated to local levels of governance. The most common distribution of responsibilities in the region is that the national level has the responsibility for defining and adopting the sector legal framework, and responsibility for management of the national budget and resources (usually implemented through a number of designated line ministries), while lower administrative levels such as regions and municipalities are usually given authorities related to local development, including provision of municipal utility services (with partial exception in Bulgaria, Hungary, and Kosovo, where the local utility service provision sector is partially owned by the central state). 20. There are large differences among countries in terms of fragmentation of municipal governance. 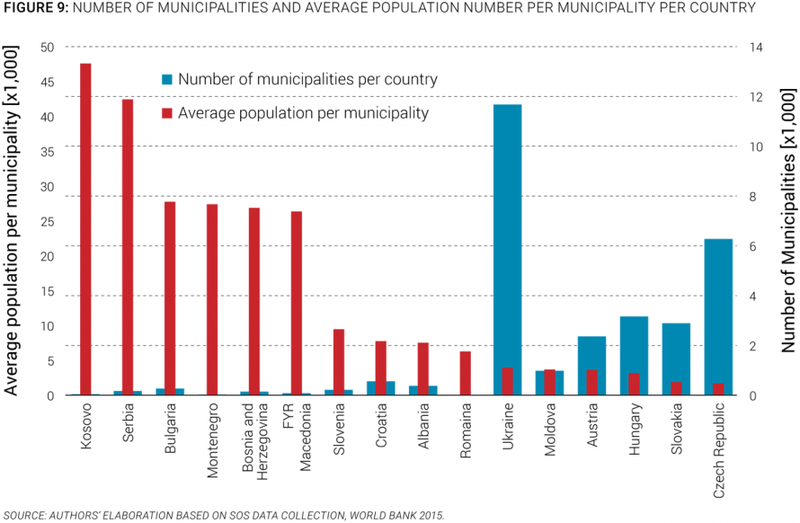 The number of municipalities, as the lowest level of governance in individual countries, varies considerably among countries, and ranges from 11,625 in Ukraine to only 23 in Montenegro. Central European countries such as Austria, the Czech Republic, Hungary, and Slovakia, with long traditions of local self-government, all have a large number of small municipalities, while relatively new countries where municipal borders were drawn recently (such as Kosovo and Montenegro) have a smaller number of relatively larger municipalities. A comparison of the number of municipalities among different countries (Figure 9) shows that they not only differ greatly in territorial size (average size of municipality ranges from 12 square kilometers [km2] in the Czech Republic to 611 km2 in Montenegro), but also in population size (average population of municipalities ranges from 1,681 in Czech Republic to 48,000 in Kosovo).